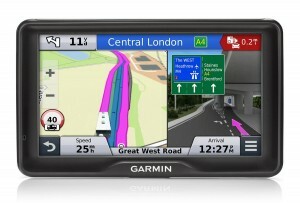 The Garmin Camper 760LMT with a large touchscreen color display, voice guidance and voice commands auto-routing accounting traffic and vehicle profile, integrated worldwide base map lane assistant, pre-loaded detailed map of Europe in addition to a USB and BlueTooth interface makes it an ideal sat nav unit to own. It is a perfect addition to a number of vehicles, most especially trucks and motorhomes. By regrouping via-points of routes with numerous transitional destinations, the Garmin Camper 760LMT facilitates very swift automatic route calculation and route optimization. Visual and voice guidance are provided for with this sat nav, with the lane assistant feature pointing out the right path in great detail in case of multiple lanes. This sat nav unit supports numerous vehicle profiles and optimizes the calculated route based on length, height, width, and weight. The Camper 760LMT comes with a large, easy to read 7 inch color touchscreen display, a tremendously sensitive antenna, an integrated world map (overview) in addition to a base map of UK and Europe. The user interface is multi-lingual and makes for easy use by way of either spoken voice commands or via the touchscreen. It does come with a built-in 7 GB memory to store the pre-loaded, detailed map of all of Europe with additional information, such as restaurants, local roads and points of interest. It is also possible to search addresses and points of interest on this unit. With a comprehensive list of motorhome parks and camping grounds, the filter function on this sat nav makes finding motorhome parks and campgrounds with specific features such as a grocery store or pool that much easier. Also included in the package is a TMC receiver to incorporate traffic news. Communication to compatible mobile phones has been made that much easier with the BlueTooth interface incorporated on this sat nav. Hands free phone calls can be made thanks to this feature. The sat nav also comes with an optional microSD memory slot to enable the storing of additional detailed maps or other data such as photos. The unit is also compatible with wireless backup cameras or option wired. It does come with the BaseCamp software that enables you plan your routes before leaving home. This means that in addition to planning routes, your journey can also be planned around geotagged photos and waypoints. 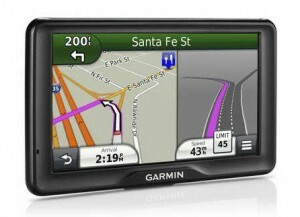 This Garmin also features traffic trends and myTrends which forecasts time of arrival based on time of day/week. 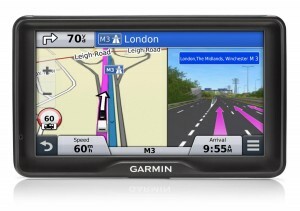 Based on past routes, this sat nav is also capable of learning your favourite routes, hence detecting where you might wish to travel and then proceed to automatically route you to your destination. Last but not least, with the Cyclops speed camera alerts, you are able to receive alerts as you approach a camera on the way to your destination. This feature however subscription charges.